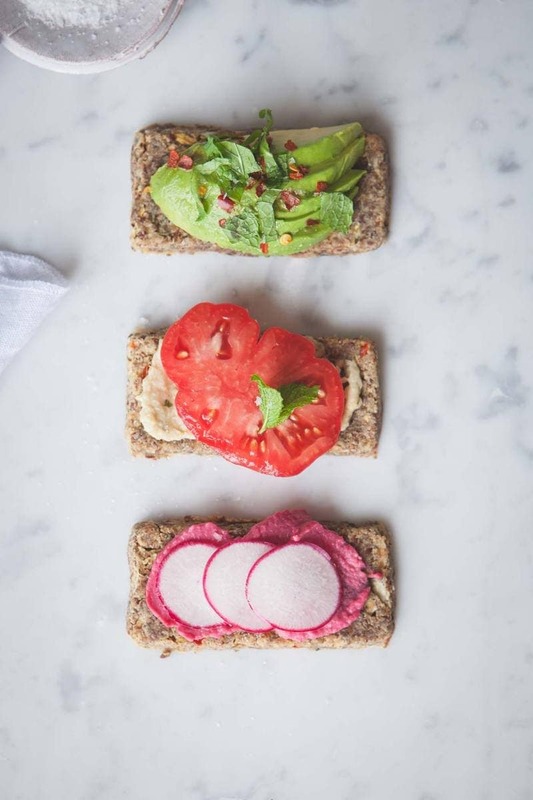 A twist on the raw foods classic. Raw onion bread is naturally gluten free, soft and spongy and pure delicious. You will need a dehydrator for this recipe, though I suspect it will also work in an oven. 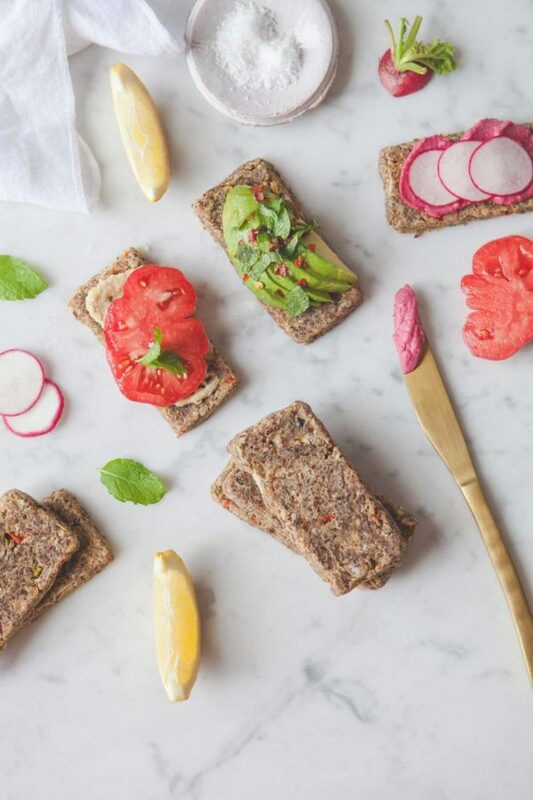 Raw onion bread is a total Raw Foods classic. The basic recipe calls for onions, sunflower seeds, flax and olive oil – that’s it. Sometimes there is the addition of nama shoyu or tamari (soy sauce) to flavour it. I’m not sure where the original recipe came from, but it’s a pretty special, fool proof basic. I think part of its popularity lies in the fact that the finished bread has a soft and spongy texture. I have adapted the basic onion bread recipe slightly, and added in some garlic, capsicum (bell peppers), zucchini, fresh thyme from the garden and miso. The miso gives it a lovely rich and slightly salty flavour, whilst adding in some beneficial probiotics. 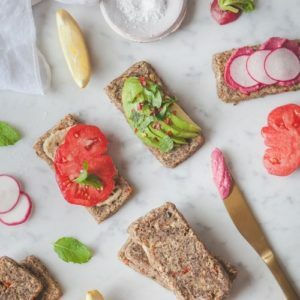 You need a dehydrator for this recipe – although, I suspect it would work fine baked in the oven – no promises though – I haven’t tried it myself! Also – during the dehydration process the onions lose their sharpness and develop a lovely subtle sweet taste. Despite it needing dehydrator time, the making of this bread is quick and simple (albeit a wee bit teary, thank you onions). Now, since Raw Onion Bread is choc-filled with onions, it makes it a good source of quercetin. Quercetin is a natural compound (a flavonoid) found in foods such as apples, berries, black tea, buckwheat, broccoli, grapes and red wine . Quercetin is a powerful antioxidant with 3.5 fold greater antioxidant activity than curcumin – a compound in turmeric . It has anti-inflammatory actions, and, studies suggest it helps lower blood pressure and protects the cardiovascular system . It also has an anti-allergic effect, inhibiting the degranulation of mast cells, and thus preventing the release of histamine – the chemical responsible for those typical allergic, running nose and watery eyes symptoms . As with most fruits and vegetables, the flavonoids are most potently concentrated in the skin and outer layers . So, if you have to peel it, take care to remove just a thin layer. Finally – if anyone has tips or tricks to share re. handling onions without crying like a baby, please share! I wear my sunglasses in the kitchen. There must be a better way! 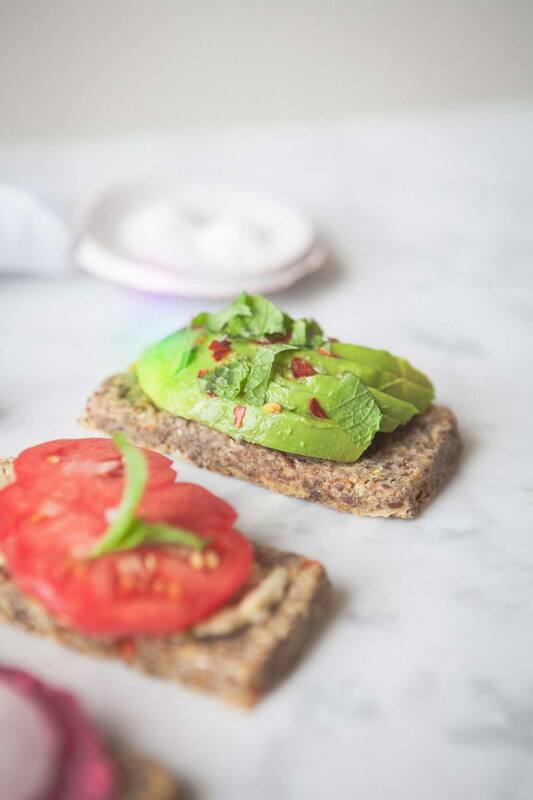 A twist on the raw foods classic. 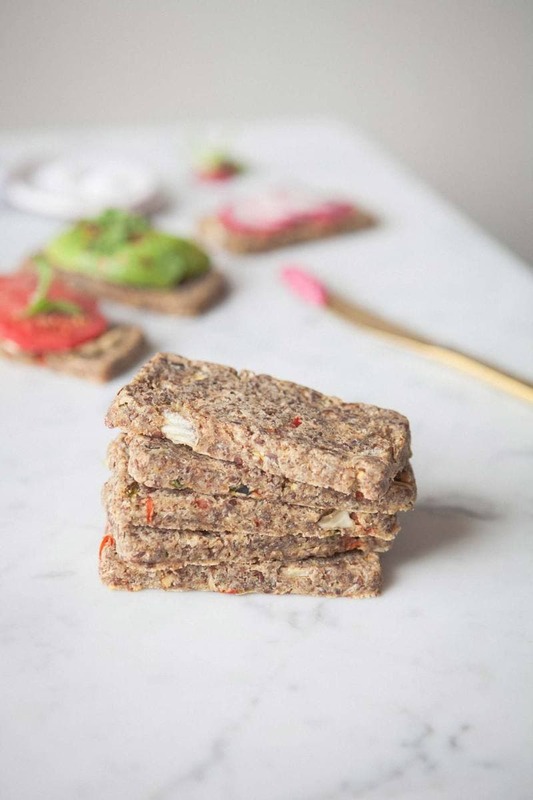 Raw Onion Bread is naturally gluten free, soft and spongy and pure delicious. You will need a dehydrator for this recipe, though I suspect it would also work in the oven. Please note the active prep time is around 20 minutes, this excludes the 13 hours required to dehydrate the onion bread. Peel and roughly chop the onions, place in food processor and blend till very fine. Add capsicum and zucchini and blend again till finely chopped. Transfer to a large mixing bowl, add all other ingredients and use your hands to work the mixture so that all ingredients come together in a dough. Spread 2-3 cups of the mixture over a teflex sheet on a dehydrator tray, so it is about ¼ inch thick. Lightly score the surface to make for easier cutting later. Alternatively, press ¼ cup of mixture into a silicon mould (small bread shaped), then pop it out and repeat till you’ve worked your way through the whole lot. Dehydrate for one hour at 145˚F, this helps seal the outside. Now turn the temperature down to 115˚F for a further 12 hours (or longer for a firmer bread). At the halfway mark, cut the bread along the score marks then flip. If you used silicon moulds to shape your bread, flip them over too.